Louisville heads into the bye week with a 2-5 record. A cold start for Louisville becomes even colder, as the Cards (2-5) lose steam in the second half and fall short to Boston College 38-20. Louisville had another rough start to the game, suffering back-to-back three-and-out drives and letting Boston College jump to an early 14-0 lead. Anthony Brown connected on a 26-yard touchdown throw to Hunter Long, then the Eagles scored again on a two-yard run by Ben Glines. Despite the early 14-0 deficit, Louisville's defense forced a couple of turnovers to put themselves back in the game. Their third drive resulted in another punt, but Louisville's defense recovered a fumble inside Boston College's own five yard line. The Cardinals scored on a one-yard run from Malik Cunningham, a play that required a very lengthy video review to get it confirmed. A blocked extra point attempt left the score at 14-6. Boston College fumbled on the ensuing kickoff, which parlayed into another touchdown run from Hassan Hall. After a couple of drives between Louisville and Boston College, Jawon Pass ran in for another two-yard score, giving the Cardinals their first (and only) lead of the day at 20-14. Unfortunately, that is where the highlights end for Louisville. A blocked punt recovered in the end zone by Boston College gave them the lead back, and the Eagles went on to score 24 unanswered points to close the game. Colten Lichtenberg hit a 38-yard field goal to close the first half with a 24-20 Eagles lead. The Eagles then ran the ball heavily in the second half, managing to get a touchdown run from both David Bailey and Jeff Smith in the process. Despite lengthy drives by Louisville to try and close the gap, it was all for naught as Louisville punted on every drive after their last touchdown. 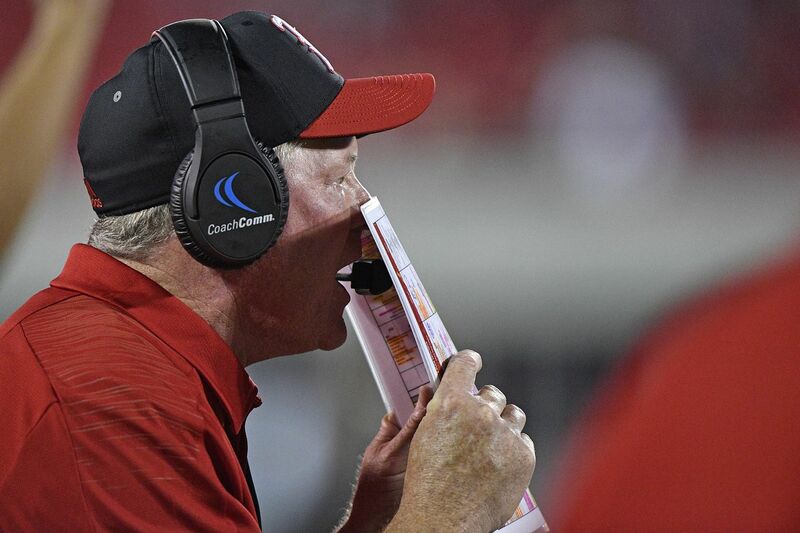 Bobby Petrino tried another quarterback change by throwing in true freshman Jordan Travis late in the fourth quarter, but it yielded no results for the offense. The main difference in the game came down to Boston College’s ability to run the football. The Eagles finished with 251 rushing yards on 4.1 yards per carry, led by David Bailey (28 carries, 112 yards, one touchdown) and Ben Glines (17 carries, 107 yards, one touchdown). Not to be left out is Boston College quarterback Anthony Brown, who had an efficient game (16-of-22, 179 yards, one touchdown and no interceptions). The Cards only rushed for 47 yards on 1.4 yards per carry, and completed 17-of-35 passes for 170 yards as a team. Dez Fitzpatrick led all Louisville receivers with four catches for 50 yards, including a sensational helmet catch in the third quarter. Louisville has a bye next week, but will return home to face Wake Forest in two weeks. Make of that what you will.